It was a good location close to metro and restaurants and shops. The owner's daughter lives close by and is a wonderful source for answering questions. Communication went smoothly for check in and check out. The outdoor space was appreciated. Paris is a very beautiful and fun city and this was a fine spot for exploring it from. I hope to be back someday. This is a great location; within blocks to two parks, grocery, bars and cafes. The location is perfect. Catching buses is easy and within blocks of the property. There are plenty of bars and cafes within two blocks. About three blocks away are groceries, cheese shops, pastries, post office, ATM, flower shops, etc. It’s a quiet flat and the patio is a great additional space. The property is small and the bathroom is very small by American standards. It should be noted that while it can sleep four - it is on two double futon type beds. Not a problem if you’re aware. Kitchen is well stocked. Washer works well and quickly but the dryer is way too slow; just plan to hang laundry and hope for sunny days or use a laundry mat around the block. We stayed here with four adults for almost two weeks. The owner and his family are fantastic. 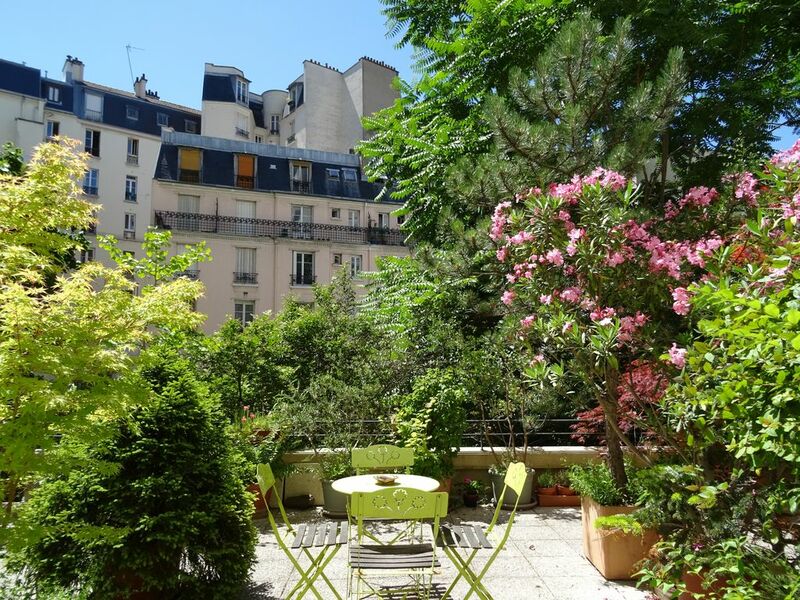 The apartment is located in a quiet, nice neighborhood, the air is clean, much cleaner than in the center of Paris, the Metro is quite close, there are plenty of food stores at a few minutes distance. I had a very nice five nights stay, comfortable bed, great wi-fi connection. I've stayed in more than a dozen Paris studio apartments s in a half-dozen arrondissements over the years, and I can't recall a better experience than this. It's close to buses and the Metro, and nearby Rue Sorbier offers a stretch of fun bars and bistros, a boulangerie and a convenience store. Marc, the owner, was punctual, gracious and helpful, reachable by text message or email throughout my visit. Though the place is tiny, the floor plan features a well-designed, fully equipped North American-style kitchen (4 burners, a real oven, microwave, dishwasher, lots of pots and pans!) and a semi-private terrace, with a patio table for four, that is leafy and quiet. Nice big windows provide light during the day. The loft bed was comfortable enough. Lots of cupboard space. Good shower and heated towel rack. I can't imagine four people sharing this small space (the bed and couch would theoretically sleep four), but for a solo traveler like me (or a couple) it's perfect. The wifi, which is a necessity for me, was fast and never crashed. Thanks, Marc. I'll definitely be back. We had a lovely stay in June. The check in process was quick and easy and Marc was incredibly responsive throughout and before our stay. The apartment was clean, and the terrasse is beautiful. Very easy access to subways and buses, and an easy walk to the Canal and to central Paris. A very cute little street with cafes and shops is close by and many other restaurants and walking areas as well. We can't wait to stay with Marc again! Lovely stay. Ideally located to all amenities! Myself and my son stayed in this lovely flat for an extended holiday. It had everything we needed including a washing machine. It was clean, well kept and had a lovely space. We enjoyed the space outside with breakfast and coffee. Just around the corner there is a park which we enjoyed regularly and is great for kids and meeting families. Also close by is a street lined with shops, restaurants, Internet cafes and a metro station. The metro doesn't take long to get into the centre and it's lovely to come back to a quieter area for the evenings. Theaters and auditorium with concerts; famous places in Paris as "la Bellevilloise"(www.labelleviloise.com), "la Maroquinerie"(www.lamaroquinerie.fr) and "Studio de l'Ermitage"(www.studio-ermitage.com)just in the street.